We interrupt the 5 Prophetic Decrees of Abundance Over Your Life series for this encouraging word I felt like somebody really needed to hear today. Have you been under attack in your life lately? Do you feel like life is a car, you’re the windshield, and you’re driving 80 miles an hour through a cloud of big, nasty bugs? If so, you’re not alone. Many other things have happened as well. I won’t bore you with them; you have your own things to deal with. None of these things are signs of impending doom; they are just warfare. They just mean that God is on the move and the enemy doesn’t like it. But you know what? God is greater, and He makes us a way of escape whenever attack comes. That phrase “lift up a standard against him” actually means that the Spirit of the Lord will make a way of escape when we are attacked. It says the Spirit of the Lord will make a way for us to flit away from the onset of the enemy. Like a butterfly flits away whenever you get near it, we can flit away from the enemy because God has made us a way of escape. This last Monday night, I wanted to escape from all this enemy attack. I asked for us to just press into Jesus as hard as we could, so He could hide us from all attacks of the enemy. And you know what? We did, and our Good, Good Father met His end of the bargain. We focused on Jesus. We stared at Him and worshipped Him as Wonderful, Counselor, Mighty God, our Good, Good Father. We fixed our gaze upon His face and adored Him. We poured our hearts upon His feet like the woman who washed Jesus’ feet with her tears and dried them with her hair. And God hid us in His bosom. He gave us rest and shelter from the enemy. I could feel the peace and rest and restoration of His presence, and I’ve still felt it every day since then. All that worship–just pressing into God–made a dramatic difference. 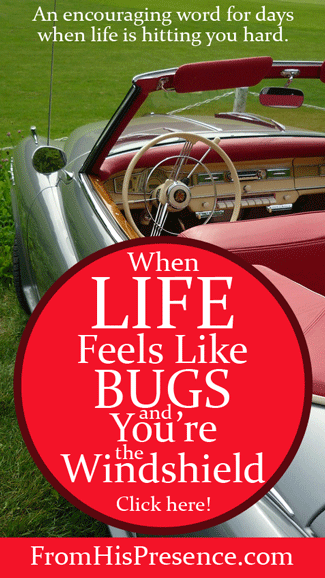 Monday during the day, my circumstances were feeling like bugs and I felt like that windshield, getting smattered with all those nasty bugs. It wasn’t pleasant. But as I pressed into God, He made all things new. Are you having a tough time at work? Are things tough in your marriage? Are you discouraged? 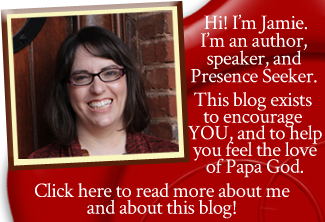 Are your children misbehaving? No matter what manner of attack you are experiencing in your life, you can run and hide in the bosom of the Father, and you will be safe there. The Holy Spirit has a way of escape for you today. That Escape is to hide in our Father Himself. No matter what you’re dealing with today, if you will hide in the Father’s bosom, you will be safe. Because you have made the Lord, who is my refuge, even the Most High, your dwelling place, no evil shall befall you, nor shall any plague come near your dwelling; for He shall give His angels charge over you, to keep you in all your ways” (Psalm 91:5-11). Keep me as the apple of Your eye; hide me under the shadow of Your wings, from the wicked who oppress me, from my deadly enemies who surround me” (Psalm 19:8-9). I don’t know about you, but my heart echoes the cry of David. Lord, keep me as the apple of Your eye! Father, hide me under the shadow of Your wings from all my enemies! Shelter me from the world, Lord, and hide me from all stress and worry! Precious reader, I don’t know what you’re going through. But our Father does. If you have made Jesus Christ the Lord of your life, then you have a Daddy God who loves you. His Spirit dwells in you, and He wants to shelter you from all attack of the enemy. All you have to do is come to Him. Press in close. Snuggle up in His lap and crawl under His wings. You will be safe there, and He will protect you. Dearest Jamie, I’m praising God for this message, and for you His faithful servant. This is for me, and on time. I’m going through so much spiritual warfare and it’s been going on for several months now where I have a part time job. I pray the Armour of God just before I go in and I’m in continual prayer throughout the day, however I will stand strong and press on in waiting for what God has for me. This comes after a two year struggle with my husbands open heart surgery and near death experience. Now, through it all the toll on my health leaves me searching for answers. I pray for a new season to come soon. I read Psalm. 91 every morning, and share my prayer requests with my prayer partners so I will wait on God. I’m praying for fresh oil Psalm. 92:10 and also II Corinthians 4:16. Blessing to you Jamie, and again thank you. Praise God, Florence. I’m so thankful He blessed you! Yes, I LOVE Psalm 91 too. God’s words in that verse have sustained me through many a heartache. You may really enjoy watching the spiritual warfare conference I blogged about today, with live streaming, if you have a chance to watch it. I was there last night and it was amazing and SOOO encouraging. Excellent teaching and great timing, Jamie. It is remarkable how every step forward brings a new onslaught of difficulties. Thank God for the promises, for the scriptures that remain true, and for your ministry of keeping those truths available. Thank you very much for sharing, teaching and encouraging us to walk close to our Savior and make better choices in life. God bless you, your family and ministry. Thank you, Jenny. I receive that blessing. Thank you very much for reading, and thank you for your words of encouragement! Have a wonderful day! So needed this this morning. So discouraged and ready to give up. It was neat you said God made all things new, because last night as I cried out to Him He said exactly that phrase to me. I love seeing Him confirm things and I can’t wait to see the victory He does out of all of this! I pray that Daddy God would surround you with His manifest presence and fill you with fullness of joy today. I release joy into you in Jesus’ name right now. I pray that He would encourage you and be your Glory and the Lifter of your head. I command strength into your spirit in Jesus’ name. I speak to your soul and command it to line up with your spirit, which is filled with the Holy Spirit, in Jesus’ name. I decree the blessings of the Bride to you today. You are the Bride of Christ and you will receive richly from Him today. Not mere crumbs–you will sit at the King’s table and receive abundantly from His goodness and generosity. In Jesus’ name. Wow Jamie- God had put that exact verse (Galatians 6:9) on my heart this morning and right before I read your comment with the article, I prayed God would bring our harvest. And then I open my email to see this! Our God is truly amazing and cares so much!! It’s so easy to feel like He doesn’t in our circumstances. Know the Lord is speaking through you!! Thank you! Yay! So glad, Jennifer! Thank you for letting me know!